The diffuser has an expanding internal diameter to decrease the velocity and increase the static pressure of air . The air leaving compressor , then through a diffuser section . The diffuser prepares the air for entry the combustion section at low velocity to permit proper mixing with fuel . Ports are built in the diffuser case through which compressor discharge air is bled off from the aircraft engine . On dual compressor engines , bleed air for service functions is also taken from additional ports located between the low and high compressors , or at intermediate stages in the high pressure compressor case . Air is bled from most engine vented over board out of the primary air flow path during certain engine operating conditions to prevent compressor surge .This is called over board and must not be confused with the air remove from the engine to perform service function . Fuel is introduced into the air stream at the front of the burners in spray form , suitable for rapid mixing with air for combustion. The fuel is carried from outside the engine , by manifold system , to nozzles mounted in the burner cans . Primary and secondary fuel manifolds are often used on large engines . The primary manifold provides sufficient fuel for low thrust operation. At high thrust , the secondary , or main manifold cuts in , and fuel commences to flow through both primary and secondary elements of double-orifice nozzle. Usually , primary fuel is sprayed through a single orifice at the center of nozzle. Secondary fuel is sprayed through a number of orifices in a ring around the center orifice. There are three basic types of burner systems in use today. They are can type , annular type and can-annular type. Fuel is introduced at the front end of the burner. Air flows in around the fuel nozzle and through the first row of combustion air holes in the liner. The air entering the forward section of the liner tends to recirculate and move up stream against the fuel spray. During combustion , this action permits rapid mixing and prevents flame blowout which acts as a continuous pilot for the rest of the burner. There are usually has only two igniter plugs in an engine. The igniter plug is usually locate in the up stream region of the burner. About 25 percent of the air actually takes part in the combustion process. The gases that result from the combustion have temperatures of 3500 degree F. Before entering the turbine , the gases must be cooled to approximately half this value , up to the designed of turbine materials involved. Cooling is done by diluting the hot gases with secondary air that enters through a set of relative large holes located toward the rear of the liner. The turbine in all modern jet engines , regardless of the type of compressor used , are of axial flow design. The turbine extract kinetic energy from the expanding gases as the gases come from the burner , converting this energy into shaft horsepower to drive the compressor and the engine accessory. Nearly three fourths of all energy available from the product of combustion is needed to drive the compressors. 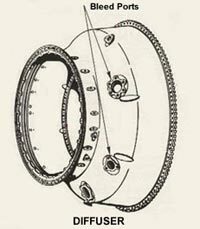 The turbine wheel is one of the most highly stressed parts in the engine. Not only must it operateat temperature 1700 degree F, but it must do so under severe centrifugal loads imposed by high rotational speeds of over 40000 rpm for small engines to 8000 rpm for a larger engines.The engine speed and turbine inlet temperature must be accurately controlled to keep the turbine within safe operating limits. The turbine assembly is made of two main parts , the disk and the blades. The disk or wheel is statically and dynamically balanced and unit specially alloyed steel usually containing large percentages of chromium , nickle , and cobalt. 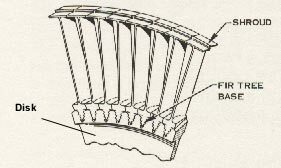 The blades are attached to the disk by means of a " fir tree " design to allow for different rates of expansion between the disk and the blade while still holding the blade firmly against centrifugal loads. The blade is kept from moving axially either by rivets , special locking tabs or devices , or another turbine stage. The blade is shrouded at the tip. The shrouded blades form a band around the perimeter of the turbine which serves to reduce blade vibrations. The shrouds improve the airflow characteristics and increase the efficiency of the turbine. The shrouds also serve to cut down gas leakage around the tips of the turbine blades. A larger total thrust can be obtained from the engine if the gases are discharged from the aircraft at a higher velocity than is permissible at the turbine outlet. An exhaust duct is therefore added , both to collect and straighten the gas flow as it comes from the turbine and to increase the velocity of the gases before they are discharged from the exhaust nozzle at the rear of the duct. 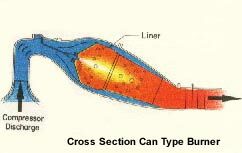 Increasing the velocity of the gases increases their momentum and increase the thrust produced.The duct is essentially a simple , stainless steel , conical or cylinder pipe . The tail cone helps smooth the flow. A conventional convergent type of exhaust duct is capable of keeping the flow through the duct constant at velocity not to exceed Mach 1.0 at the exhaust nozzle. 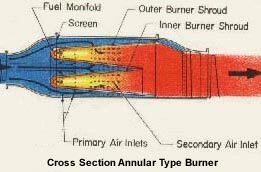 The afterburner , whose operation is much like a ram-jet , increases thrust by adding fuel to the exhaust gases after they have passed through the turbine section. At this point there is still much uncombined oxygen in the exhaust. Only approximately 25 percent of the air passing through the engine is consumed by the combustion. The remainder or 75 percent , of the air is capable of supporting additional combustion if more fuel is added. The resultant increase in the temperature and velocity of gases therefore boosts engine thrust. Most afterburners will produce an approximately 50 percent more thrust. Afterburning or " hot " operation or " reheating " is used only for a time limited operation of takeoff , climb , and maximum burst speed.